The beautiful Scottish Borders town of Melrose has plenty to offer visitors to the area, and the arrival of the new Borders Railway on the 6th of September 2015 will make it easier for tourists to reach the area without a car. Hop on the train at Waverley Station in Edinburgh and just 55 minutes later, after a relaxing journey through the scenic countryside, you will be met by one of our travel partners at Tweedbank Station to be transported to your choice of either the Burts or Townhouse Hotel, where a welcome drink awaits. After enjoying some Borders hospitality, guests are welcome to sample one of our themed excursions or activities to work up an appetite for a very special ‘Best of the Borders’ dinner. Follow this with a warming dram or a pint of local ale before retiring to the luxury of your individually styled bedroom in either one of our 4 star town centre hotels for a sound night’s sleep. On waking, there’s a magnificent Scottish Borders breakfast waiting for you before we say our farewells and transport you back to the train station at your leisure. For guests who want to stay a little longer, there are 2 and even 3 night breaks available too. The new railway offers a convenient and scenic journey of less than an hour from the city, so why not leave your car at home and let the train take the strain. Our ‘Magnificent Seven’ themed packages have been designed to highlight the best of the Borders – something to suit everyone. including luxury afternoon tea and the finest food, wine and real ales. Enjoy this famous and historic sporting event (The Melrose 7’s) in style and wander back from the Greenyards at your leisure. Described as the ‘Covent Garden of the North’, the town plays host to a fantastic selection of independent shops to explore. 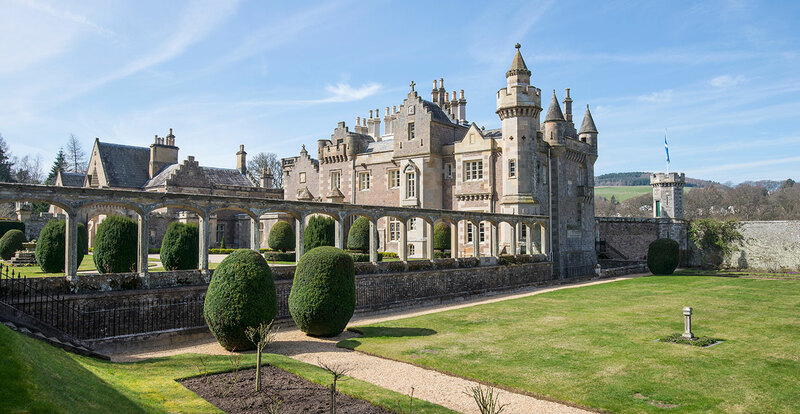 A visit to Sir Walter Scott’s romantic mansion and grounds at Abbotsford House and a trip to the iconic “Scott’s View” of the Eildon Hills and River Tweed. Guided walks along the banks of the River Tweed and around the Eildon Hills. We can meet you at the train station with bikes, a picnic and wonderful circular cycle routes for you to enjoy. Those with green fingers can enjoy the National Trust for Scotland’s Priorwood Gardens, housing Scotland’s only dedicated dried flower garden, and Harmony garden both overlooked by the majestic melrose Abbey. Also the nearby Abbotsford House Gardens, are feast for the senses. These tailor-made Melrose themed breaks are just a taster of what is on offer at Burts and Townhouse throughout the year – all of them different and all of them magnificent! To find out more about these breaks or discuss your ideal show break with us, please contact Burts on 01896 822285 or Townhouse on 01896 822645.